Almost one year ago, I along with a handful of other very talented bloggers started baking our way through the Momofuku Milk Bar cookbook. Most of you know that this book quickly became one of my absolute favorites – and not just for the recipes – but for the techniques, the quirky ingredients, the interesting recipe names, etc. This cookbook has introduced me to baking with some interesting ingredients: dry milk powder, freeze-dried corn, glucose, and now dried blueberries. Truthfully I wasn’t even sure where to find these but my good friend Trader Joe came to the rescue and let me tell you that I was afraid that I wasn’t even going to have enough of these blueberries left for the recipe – let’s just say I’ve found my new favorite snack. 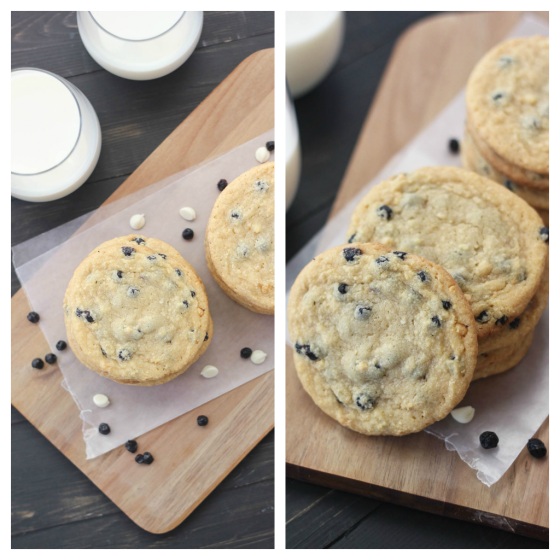 I love the Milk Bar cookie recipes – Christina Tosi just knows how to mix up some cookie dough. These cookies start with your basic butter-sugar mixture, followed by flour, leavening salt, etc. And then follows sweet and creamy dried blueberries and Milk Crumb. You might remember from the birthday layer cake that I have a thing with the crumb recipes in this book. And this one is no different – sweet buttery heaven, it is. These cookies really are perfect – brown and chewy around the edges but soft and oh-so buttery on the inside, with the sweet notes of the dried blueberries. Note: the recipe looks long but it’s actually a very simple cookie recipe; the milk crumb needs to be made before the cookies are made and the dough needs to chill – both of these steps are the time-consuming part. Momofuku Milk Bar's recipe for blueberry and cream cookies. Preheat oven to 250°F. Line large rimmed baking sheet with parchment. Combine 1/2 cup milk powder, flour, sugar, cornstarch, and coarse salt in medium bowl; toss to mix evenly. Add butter and stir until clusters form. Spread mixture evenly on prepared sheet. Bake until crumbs are dry and crumbly but still pale, about 20 minutes. Cool completely. Crumble any large clusters, and transfer all of the crumbs to a bowl. Add the additional 1/4 cup milk powder and toss. Pour the white chocolate over the crumbs and toss. Continue to toss every 5 minutes until the white chocolate hardens and the clusters are no longer sticky. Mix the flour, baking powder, baking soda and salt in a bowl and set aside. In the bowl of a stand mixer fitted with a paddle attachment, cream the butter, sugars and glucose on high for 2-3 minutes. Scrape down the sides of the bowl. Add the eggs and beat for an additional 7-8 minutes until fluffy and doubled in size. See my confetti cookie post for details on this process. Reduce the speed to low and add the dry ingredients and mix just until the cookie dough comes together, no longer than 1 minute. Scrape down the sides of the bowl. While on low speed, add the milk crumbs and the dried blueberries and mix for 30 seconds. Using a 2 3/4-ounce ice cream scoop (or 1/3-cup measuring cup), portion the dough onto a parchment-lined baking sheet pan. Pat the tops of the cookies down, cover tighly with plastic wrap and refrigerate at least 1 hour, or up to 1 week. Do not bake your cookies from room temperature! Heat the oven to 350 degrees. Line two large cookie sheets with parchment paper or Silpat liners. Arrange the chilled dough about 4 inches apart on the prepared baking sheets. Bake for 18 minutes. The cookies will puff, crackle and spread. After 18 minutes, they should be just browned on the edges and still bright in the centers. Cool the cookies completely on the cookie sheets before transferring to an airtight container. I found dried blueberries at Trader Joe's near the dried cranberries, etc. Most grocery stores should have them or you can order them from Amazon.com; don't get freeze-dried berries, just the dried ones. Or you could just swap the blueberries for any of your favorite dried fruit. YES! Dried blueberries are so delicious…way better than raisins 🙂 And this cookies look equally addicting! I think I might have to invest in the Milk Bar cookbook. I’ve had my eye on the Birthday Layer Cake for a while; and my birthday is next week! Hmm. These look incredible, Cassie! I would love one of these with a tall glass of milk. I still have not gotten this book, but I definitely want too. I love love love dried blueberries!!!! Your cookies look almost too perfect to eat!! I adore dried blueberries too! They’re delish! These cookies look fantastic! We had one of these cookies when we were in NY – my boyfriend said it was the best cookie he’d ever had in his life and I’ve still not tried making them at home! I really need to give them a go, thanks for the inspiration Cassie! Everything about this cookie sounds SO good to me! Love it. I have loved seeing all of your Milk Bar Monday posts, these are no different! Oh YES. I love cream and fruit together! What an interesting recipe! They sound fabulous, and I’m intrigued to try using nonfat milk powder. What an enticing recipe! 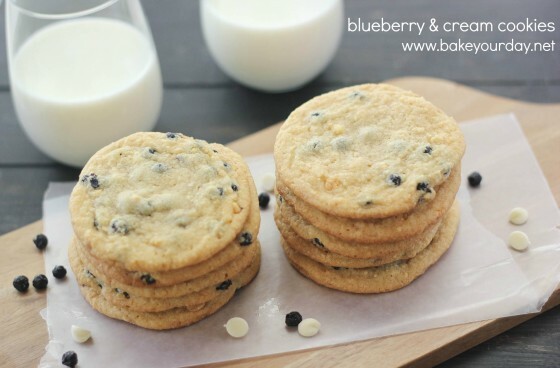 I need blueberry cookies right now…. Cassie, I get so pumped every time that I see you are doing a Milkbar recipe! You described them perfectly with the “quirky” ingredients, but seriously, anything I have eaten from that bakery I have professed “changed my life,” lol. I love dried blueberries too! What a wonderful cookie. My husband would go crazy for these! Anything with blueberries 🙂 And I’m very intrigued by milk crumbs! What a great cookie recipe. Can’t wait to try it! These are some delicious flavors going on here! Love the flavors in this cookie! YUM! I love that Milkbar book like it was my child. Truly. This recipe sounds SO. AMAZING. Love these – love love love. I could use a dozen of these bad boys right now! And I totally didn’t know they made freeze dried blueberries. So fun! Love the idea behind using and baking with nonfat dried milk powder. Gorgeous photos, Cassie! Looks like I’m going to be on the lookout for dried blueberries!! I thought these were awesome! And I can’t believe it’s been a year.. Oh how time flies. Your cookies look like they turned out beautifully. Next time I’m going to look a little harder for the dried blueberries. I love dried blueberries and I’ve never had a cookie quite like this, sounds wonderful! I’m so glad that Milk Bar Monday is back! These look and sound delicious, Cassie. Like summer in a bite. These sound amazing! I’ve been dying to try the Milk Bar cookbook but haven’t gotten around to it…sounds like I need to for these cookies. I think I could eat these for breakfast! These lovely little cookies sound (and look) so delicious and fun, Cassie! Great pick for Milk Bar Monday!! I am totally intrigued by the “milk crumbs”. These cookies look perfect to enjoy with a cup of tea. P.S. I have the disappearing issues with blue berries too, I never have enough for my recipes. These look fantastic! I love dried blueberries. We have a dehydrator and love dehydrating blueberries in the summer! This is one I wanted to try but alas, has not happened. You make them look so amazing, Cassie! Blueberries are not something I’ve ever put in cookies…mango, pineapple, cherries, yes. But never blueberries. I need to start! This is one I wanted to try but alas, has not happened. You make them look so amazing, Cassie! Blueberries are not something I’ve ever put in cookies…mango, pineapple, cherries, yes. But never blueberries. I need to start! And by that, either fresh or dried. Must get on that! Oh, it’s totally my pleasure. I remember what it was like the day after I got engaged…cloud 9! And I love celebrating those who are experiencing it! These cookies sound so good, Cassie! Love the blueberries and cream idea! Looks like there is a trip to Trader Joe’s in my future. I want, I want, I WANT! I don’t think I’ve seen a prettier cookie in all my life. For realz. wow, these look insanely good! I must give these a try — and I must buy that book! These look so perfect, amazing and beautiful…I want 3 right now! These look so yummy!!! Love, love, love them! The Milk Bar cookbook was the first cookbook I ever read like a novel. The recipes are time consuming but oh, so worth it. Your cookies and photo are beautiful! These cookies look divine! I love dried blueberries! 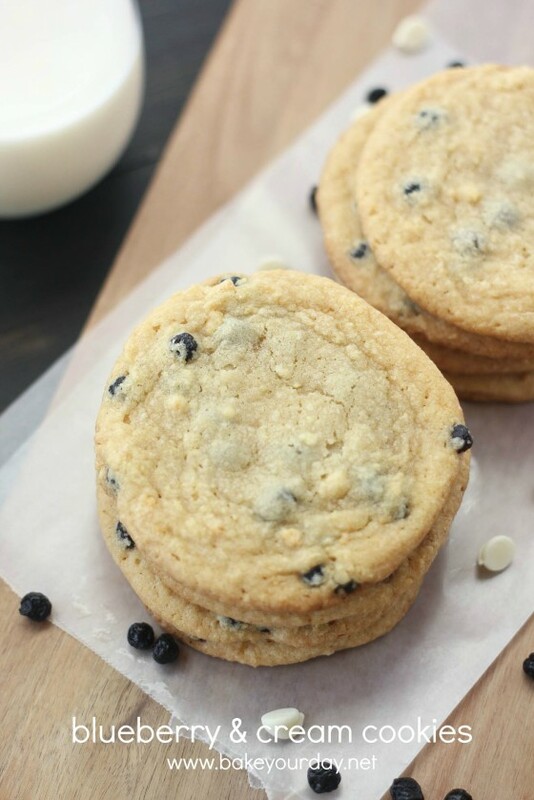 OMG, blueberries *and* white chocolate in one cookie?! I think I’ve died and gone to heaven 🙂 I actually just requested this book from my library (for like the 5th time), I am so eager to get baking! I am always so impressed by your Milk Bar Mondays posts since I”ve never worked up the courage to make ANYTHING from that cookbook! Sigh. Soon. These cookies look awesome. I love the idea of getting the cream flavor from the milk crumbs! OK – I’m obsessing over your photographs!! Bonus that these cookies look awesome, love that they are big and thin!! This is such an interesting recipe – I can’t wait to try it! 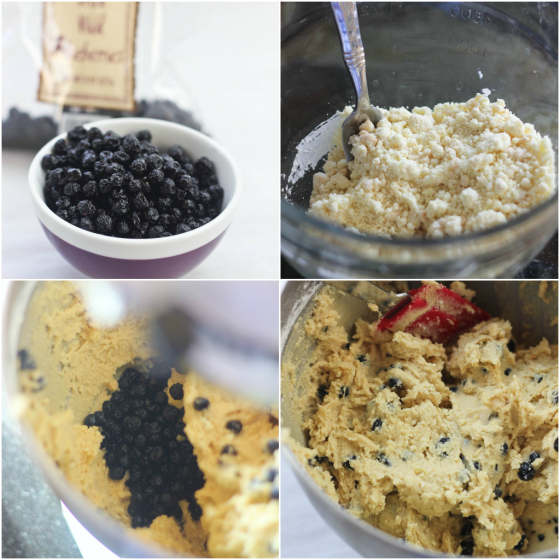 I’ve never used dry milk powder or dried blueberries in cookies before. I love learning new things – thanks! These sounds so Spring-y! And scrumptious looking too! This is one of my favorites of the Momofuku cookies….corn cookie still owns my heart though!!! These sound wonderful and I love the flavor combination! Where does one find glucose and is there a substitute? I’ve made some of the other cookies her her book, delish, can’t wait to try these! Hi Thea, I buy it at Hobby Lobby but you can probably find it at any baking supply store or hobby store. Or, you can sub half of the amount called for with light corn syrup…it won’t be exactly the same, but will work just fine! I need to try one of her recipes. They all look so good. I have never tried freeze dried blueberries before, but now I am intrigued! I have wanted to make these cookies since I received MilkBar as well! I am so glad to hear that they are great as they sound! I love how TJ’s has dried blueberries and strawberries and for a fraction of the cost of what you find them for at a typical grocery store! OMG, Cassie! I have to make these asap!!! I can honestly say I’ve never had dried blueberries in my cookies, but I’m willing to try it! So excited to see Milk Bars Mondays again 🙂 The crumb used in those cookie recipes is beyond addicting!!! Sold. I am so sold. Dried blueberries are heavenly! I love all Momofuku recipes. I have wanted to make these for years. After hearing they’re as good as they look and sound, I’ll have to give them a try finally! These sound like an outstanding cookie, and one I will definitely try. I can’t walk out of Trader Joe’s without a couple bags of those insanely delicious dried wild blueberries – they are truly one of Trader Joe’s greatest gifts to my belly! I never would have thought to seek out dried blueberries – but it makes total sense! And these look absolutely perfect, Cassie. These look divine! However, what is slat? I haven’t heard of it before and I highly doubt I will be able find it here in China. Are there any possible substitutes? I was wondering what brand of milk powder you use, and do you get it online?